WHAT IS A REALITY CHECK? DO I NEED ONE? 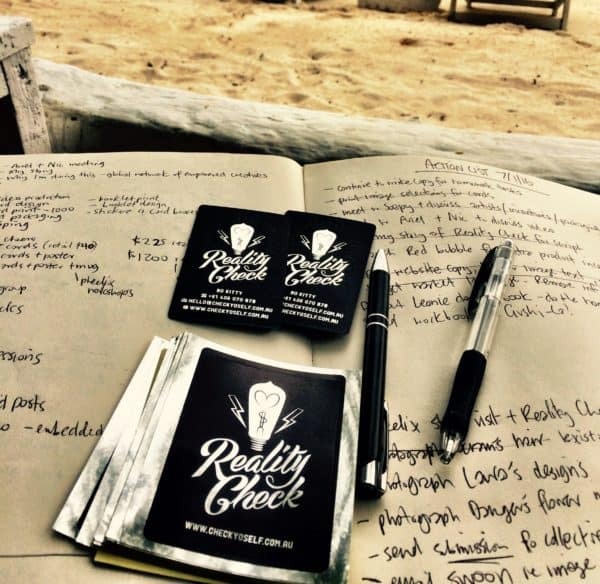 Reality Check is a holistic mix of business marketing and life coaching. Seeking a new paradigm? Have a business idea? Need a marketing strategy overhaul? Want to make more cash with less time & live a more holistic life? Want to live more creatively? Often things in life can get in the way however, like family, bread and butter jobs, time to do everything, financial constraints and emotional wellbeing. You can’t forge onwards with your creative life if you aren’t sure what your next move with your career should be. Some of my favourite subjects include…. Goal setting and then actually doing. Networking and reaching new demographics and a whole lot more….. NOTE : YOU WILL HAVE HOMEWORK – BUT I PROMISE IT WILL BE FUN! The developing vibrant network around Reality Check is inspiring, many now earning a long-term regular income for doing what they love. ARE YOU READY TO ACTIVATE CHANGE AND REACH THE NEXT LEVEL? OKAY YES, I’M READY, LET’S DO THIS! 30 minutes We can do a free intake phone call to see if we’re right for each other. We confirm an appointment time, payment upfront secures your appointment. You fill out the intake form, ten questions to answer before we meet, to get you thinking hard about what’s important. Please put as much detail in here as possible! Questions must be submitted 48 hours before your session. 1 hour At your in-person strategy session, either in Reservoir or on Skype – using intuitive questioning and rapid fire examination, I guarantee clarity on your direction and passions, and we end up with a solid action plan and homework we decide on. We agree together to smash it. I also guarantee tools, networks, marketing strategy experience and entry to a private group online of determined entrepreneurs and freelancers worldwide. The results are up to us, they are up to you.